Managed application services offer expert IT professional methodologies to maintain, support, and enhance crucial applications of an organization. These services enable organizations to focus on their core competencies by outsourcing the management services of legacy applications maintenance. Moreover, these services can be delivered for applications deployed on the cloud as well as on premise. 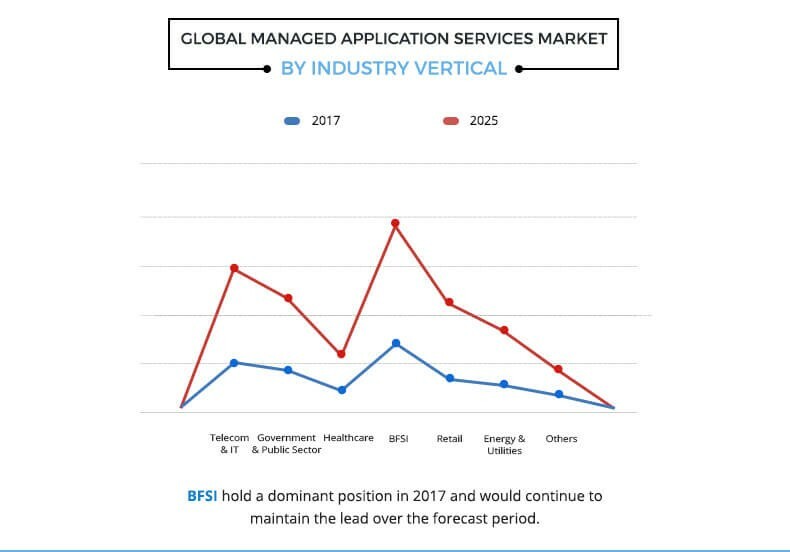 The global managed application services market size was $7,311 million in 2017, and is projected to reach $16,441 million by 2025, growing at a CAGR of 10.8% from 2018 to 2025. Rise in demand for end-to-end application hosting and need to improve & secure critical business applications drive the growth of the managed application services market. Furthermore, migration of applications and workload on cloud, surge in hybrid model adoption, and increase in demand for outsourcing of repetitive application maintenance tasks such as deploying patches and upgrades, monitoring of applications, are the major factors responsible for the growth of the market. In addition, rise in complexity level of applications is expected to provide lucrative opportunities for the managed application services market growth. However, high risk associated with application data security is expected to impede the growth of this market. The application hosting services segment led the market in 2017. However, the application infrastructure services segment is expected to grow at a significant pace during the forecast period. 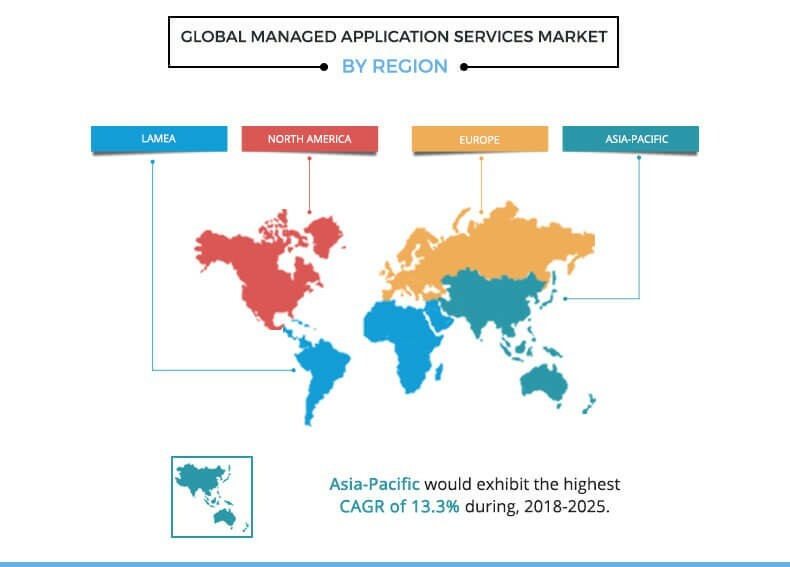 Furthermore, Asia-Pacific is expected to show high growth rate, as it experienced the highest demand for managed application services owing to rise in complexity of application infrastructure. The report focuses on the growth prospects and restraints of the market based on the analysis of managed application services market trends. The study provides Porters five forces analysis of the industry to understand the impact of various factors such as bargaining power of suppliers, competitive intensity of competitors, threat of new entrants, threat of substitutes, and bargaining power of buyers on the growth of the market. The global managed application services market is segmented based on service type, organization size, application type, industry vertical, and region. Based on service type, it is divided into operational services, application service desk, application hosting, application security & disaster recovery services, and application infrastructure. Based on organization size, the market is bifurcated into small and medium sized enterprises (SMEs) & large enterprises. Based on application type, the market is classified into web-based applications and mobile applications. Based on industry vertical, it is divided into telecom & IT, government, healthcare, BFSI, retail, energy & utilities, and others. Based on region, the market is analyzed across North America, Europe, Asia-Pacific, and LAMEA. The global managed application services market is dominated by key players such as BMC Software, Inc., Rackspace US, Inc., DXC.Technology Company, Fujitsu, HCL Technologies Limited, International Business Management (IBM) Corporation, Wipro Limited, Navisite (Spectrum Enterprise), Virtustream, and YASH Technologies. Increase in demand for end-to-end application hosting, need to improve and secure critical business applications, and surge in application complexity drive the demand for managed application services market. However, risks associated with application data security hamper the market growth. Rise in demand for end-to-end application hosting due to its numerous benefits is expected to boost the growth of the market. It includes benefits such as no vendor installation, low costs, minimized risk, no long-term commitment, backups, and security. Application hosting allows access from a remote cloud infrastructure through the internet. Growth in adoption of cloud technology has created a huge demand for managed application hosting services. Application hosting services enable clients to focus on improving the application instead of worrying about the infrastructure issues. Cloud engineers manage the infrastructure including OS patches, upgrades, monitoring, and others to enable development teams focus on core business objectives. The need to assess applications throughout their lifecycles further drives the growth of this market. Managed application services facilitate monitoring and maintenance of business applications by a managed service provider for a subscription-based fee for SMEs as well as large enterprises, thus, reducing the risk of downtime. Large enterprises have realized the importance of reducing IT downtime for business applications as leads to a considerable loss of revenue. Further, increase in need for business continuity and disaster recovery services owing to rise in business risks caused by application vulnerability fuel the growth of the global managed application services market. Thus, organizations adopt managed application services to alleviate risk of downtime. Furthermore, managed application services providers have access to skill pools for managing various critical business applications. This is advantageous for the organization as it helps to save the cost associated with hiring the required IT talent and technical expertise. Hence, managed application services are being adopted by enterprises to improve the performance, system availability, application uptime, and security of business-critical applications across all sectors. Implementation of managed application services has provided organizations with considerable opportunities to improve agility, efficiency, speed, and manageability within their IT environments. Moreover, use of these services improves efficiency and performance of application infrastructure without making additional investments in hardware. 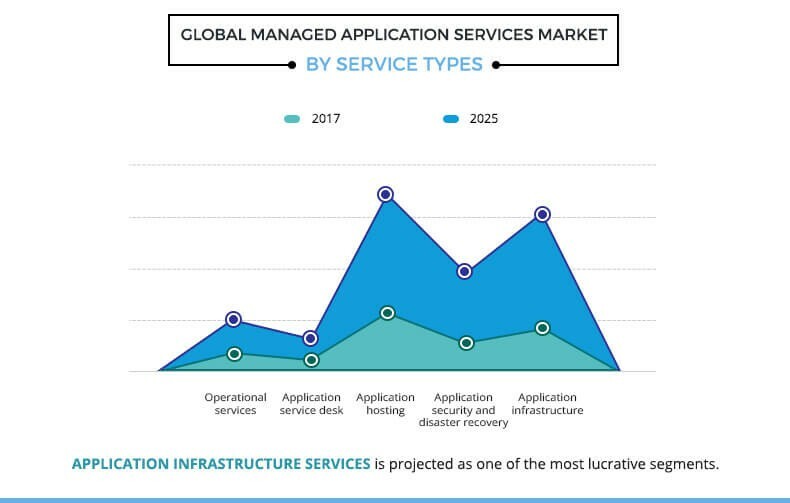 Increased complexity of application infrastructure owing to the adoption of hybrid models in large enterprises is opportunistic for the managed application services market. In addition, ongoing trend of application modernization due to improved digital expertise of an organization drives the growth of this market. Furthermore, the trend of minimizing capital as well as operating expenditure is anticipated to create large opportunities for this market. Owing to its numerous advantages, several companies have invested in managed application services technology, which is expected to provide lucrative opportunities for the market. The managed application services come with security concerns of application data, which impedes the growth of the market. Organizations find it difficult to trust third-party companies while operating the business-critical application data. This lack of trust by other organizations on third party managed application service providers results in hesitancy for adopting managed services, which in turn hampers the growth of this market. 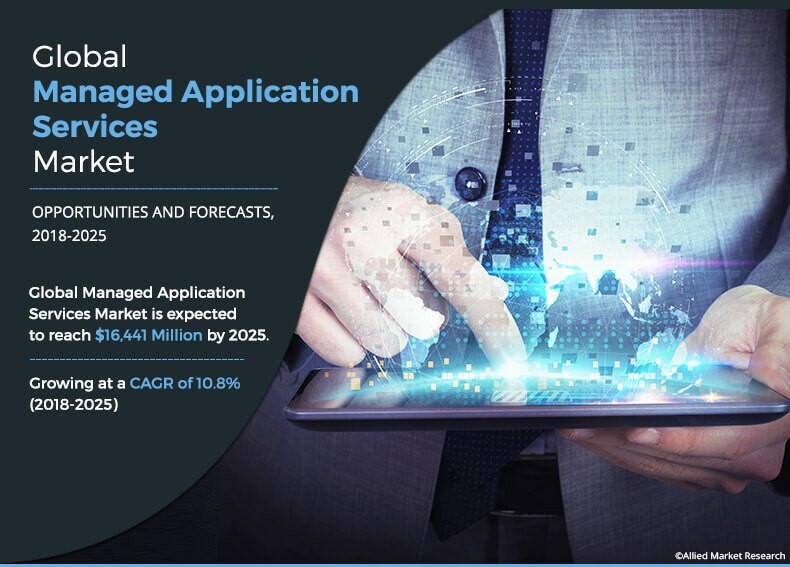 This study includes the analytical depiction of the global managed application services market along with current trends and future estimations to determine the imminent investment pockets. Porters five forces analysis illustrates the potency of buyers & suppliers in the global managed application services industry. Managed application services provide expert IT professionals methodologies to maintain, support, and enhance critical applications of an organization. In addition, these services offer management of entire application portfolio or its significant components to reduce the time spent on IT management and enhance the focus on strategic, core business competencies. Demand for managed application services has increased owing to rise in expenditure on application hosting and increase in need for application monitoring and alerting services. Further, rise in demand for managed application backup and recovery as well as disaster recovery due to the growing concerns for data security are expected to be opportunistic for the managed application services market. Furthermore, the global managed application services market is witnessing the trend of bundled IT solutions that include infrastructure and application hosting as well as managed services and security services, which are anticipated to boost the growth of the market during the forecast period. Moreover, extensive adoption of cloud technology and increased penetration of mobile applications are anticipated to create lucrative opportunities for the market during the forecast period. Leading vendors operating in the market have introduced managed application services for cloud applications as well multi-cloud, hybrid models. The key players profiled in the report include BMC Software, Inc., Rackspace US, Inc., DXC Technology Company, Fujitsu, HCL Technologies Limited, International Business Management (IBM) Corporation, Wipro Limited, Navisite, Virtustream, and YASH Technologies. These players have adopted various growth strategies to enhance their product portfolio and increase market penetration. They have launched new products to increase their customer base and cater to the growth in customer demand. For instance, in May 2018, Rackspace launched Kubernetes-as-a-Service solution with fully managed operations that transform the way enterprises can utilize new container technologies, thus, accelerating their digital transformation.